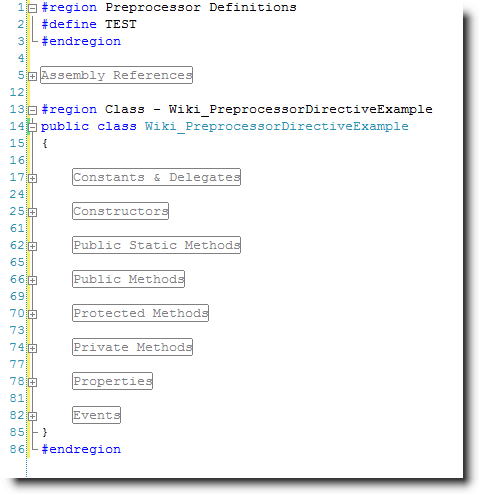 What is a Preprocessor Directive? 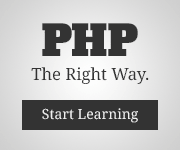 A preprocessor directive is a piece of code that is meant explicitly for the compiler. This offers a programmer to focus compilation for a specific environment at compile time instead of runtime. How do i identify a Preprocessor Directive? 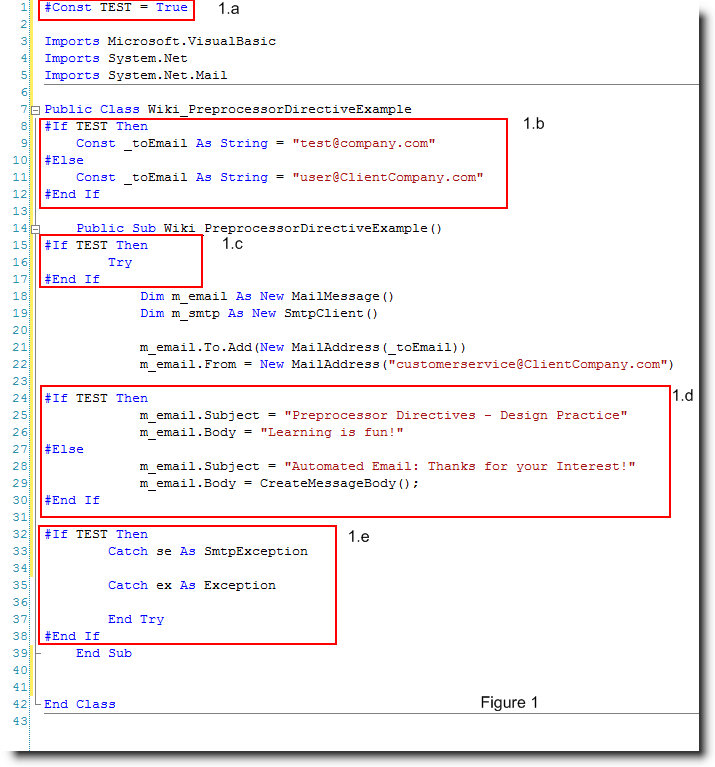 What’s the advantage of using Preprocessor Directives? Depending on the Preprocessor Directive there are many advantages to using directives over in code conditional statements. Pairing the #define, #if, #else, and #endif Conditional statements allows you to set variables to target your Testing vs. Production environments. Pairing the #Const, #If…Then. #else, and #End If Conditional statements allow you to set variables to target your Testing vs. Production environments. This is how you declare a preprocessor directive. I’ve defined a TEST variable to be able to switch between my Test environment and Production environment. 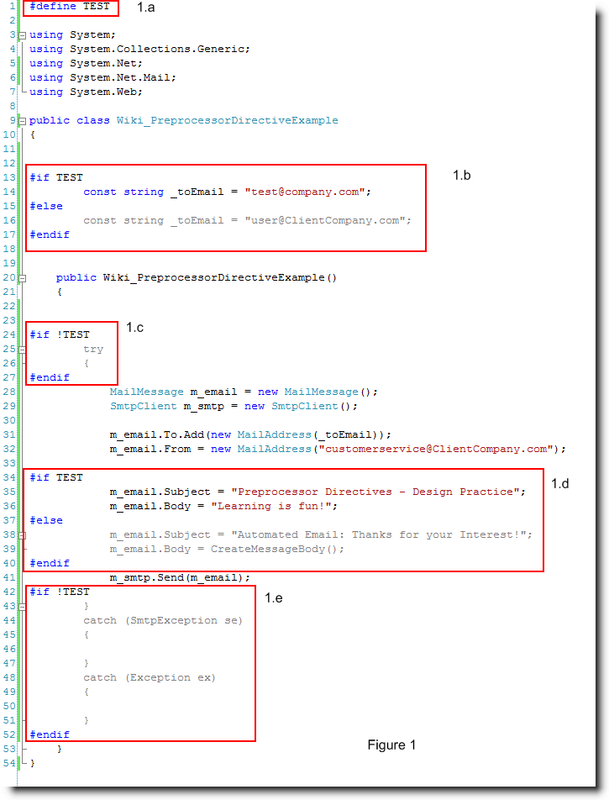 Using the conditional directive, I check to see if TEST is defined, seeing how it is currently defined the constant _toEmail gets set to ‘test@company.com’. However if i was to comment out the #define TEST, the _toEmail constant would be set to ‘user@ClientCompany.com’. This scenerio is just to show that member variables can also be changed by a preprocessor condition. This can come in handy if you pair the condition to change the subject to match a rule you have set up in outlook for test email filtering. Now that i’ve run through some testing and have seen the Exceptions that my program is throwing i can now catch the appropriate Exceptions and handle them. Once you have a good idea of what exceptions you need to handle you can remove the preprocessor condition and the try catch block can be tested to show the appropriate user friendly messages. 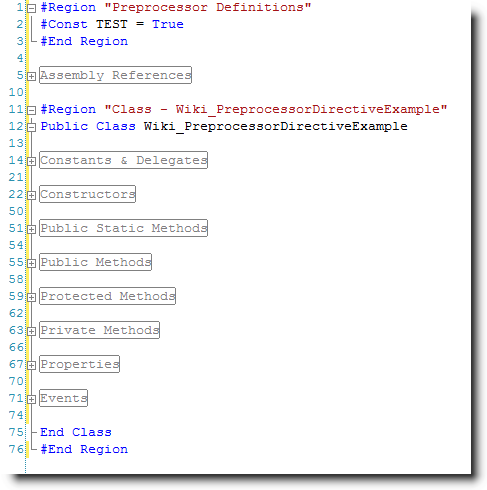 Hopefully now that you have seen an example you can understand some of the advantages of using preprocessor directives. If you would have made an in code switch in 1.b, you would have had to declare an extra boolean, and the conditional statement would be taking up valuable runtime processing time, memory for the (unnecessary) variable. When using the preprocessing directives in Visual Studio, you will notice that there is a visual queue as to what variable is currently active. This makes your application more readable, for you and future developers working on your code, as well as saving your countless read throughs of your code to understand what version of your code is running. Using the #region and #endregion directives you can outline sections of your code and logically organize them within a descriptive code region. Using #Region and #End Region directives you can outline sections of your code and logically organize them within a descriptive code region. Hopefully you can see the usefulness of #regions (#Regions in VB.NET). Not only can you label sections of code, but in the Visual Studio IDE these tags allow you to collapse the code contained in the directive to make your code smaller and easier to read, maintain and manage. Hopefully over the course of this article you have seen some of the benefits of using Preprocessor Directives. Remember: Preprocessor Directives are evaluated at Compile time eleminating bottle necks of conditional statements in your code to switch between Testing and Production code are eliminated freeing up resources for your actual application.